Erin Shirreff: Halves and Wholes. Erin Shirreff is not a photographer, she would tell you, even if the photographic image lies at the center of her practice. Known primarily for her photo- and video-based work, Shirreff is part of a generation of young artists whose reflections on photography have revitalized the medium, but who eschew thinking of themselves as photographers in the classical sense. 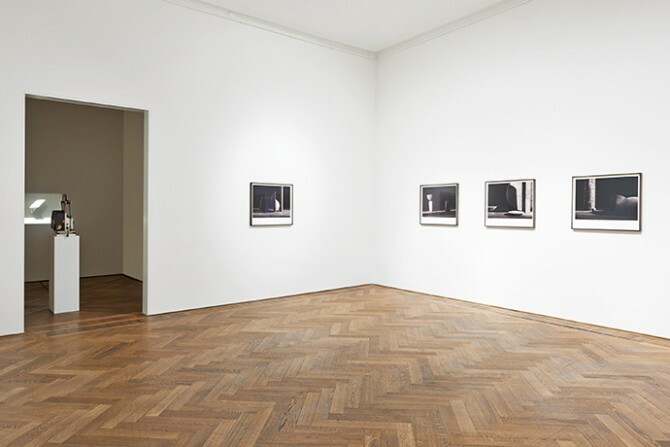 And whereas in her work it often appears that art historical references abound (for instance to Donald Judd and Tony Smith, in two pieces in her Kunsthalle Basel exhibition, or to Medardo Rosso and James Turrell in previous works), her resultant still and moving images are not really about such seeming references. Instead, Shirreff mines the vexed questions of how images mean and matter to us, and how we negotiate the distance between an object and its photographic representation, or between a photographic representation and our memory of what it shows. To do so, she often focuses her gaze on historical artworks because of the nebulous quality known as “aura” – a distinguishing specialness – that they seem to possess. This is everywhere evident in Halves and Wholes at Kunsthalle Basel, the Canadian artist’s first solo presentation in a European institution. 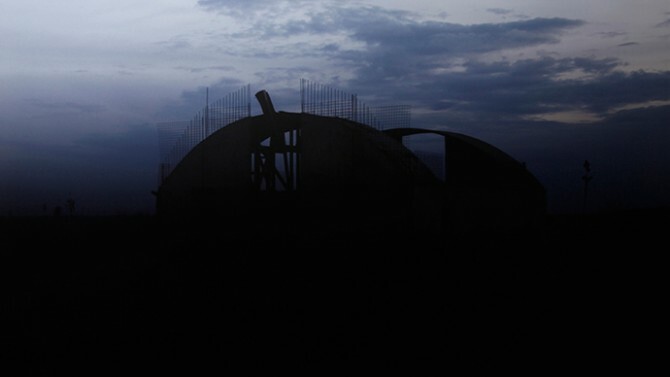 The centerpiece of the exhibition is a new video, Concrete Buildings (2013-16). 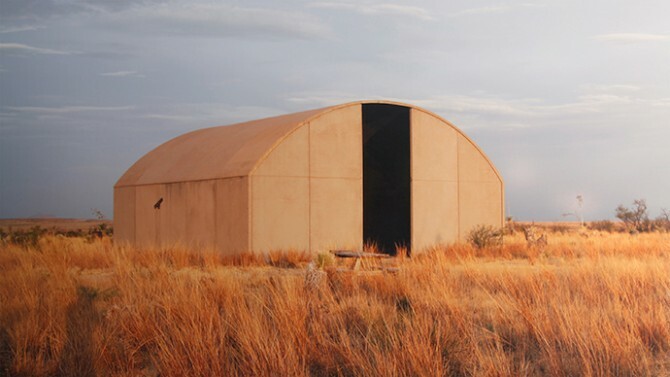 Each of its projections is devoted to one of the (only) two pieces of architecture that Donald Judd entirely designed and built in his lifetime; Judd intended them as ideal spaces to house and display his artworks as well as those of several artists close to him. Shirreff’s video in two parts, each with a different temporality, endows the imagery with a heft and presence best described as sculptural. Each is composed of a decidedly layered and labored combination of moving sequences and countless still images, made by the artist and then re-photographed in her studio. 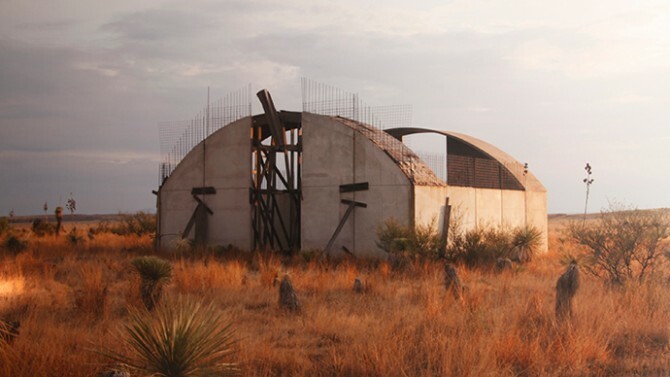 On the surface, nothing much “happens”: we see the two concrete prototype structures (ten buildings in all were originally planned) in their current state, at once halted and ruinous in the landscape of Marfa, Texas, having failed to stand up as built structures. And yet in filming and photographing them in varying light and weather conditions, watching, tracking, almost caressing them – with the tenacity of a private detective and the tenderness of a lover – Shirreff turns them into emblems of time, mortality, and maybe even folly, as they reveal the possibilities and limits of one man’s (built) vision. Shirreff’s work, here as elsewhere, suggests a persistent concern with what happens to us when we look at something. She admits to being haunted herself by the physical and emotional affect of duration: not necessarily the temporal length of a video, for instance, but the everlastingness implied by the art objects she is drawn to. 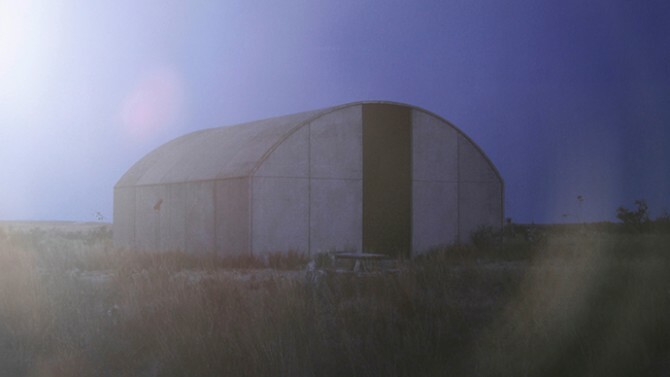 In Judd’s case, this is felt in his constructions – conceived, built, failed, aborted, and then left to the elements – which in Shirreff’s hands become a cipher for the onlooker watching them, equally subject to the passage of time. This preoccupation with the temporal determined for her the (long) duration of her two-part video, and we might understand duration as its true subject, more than Judd or Minimalism or architecture per se. Time is arguably also the subject of Still (2016), a series of nine new black-and-white photographs. 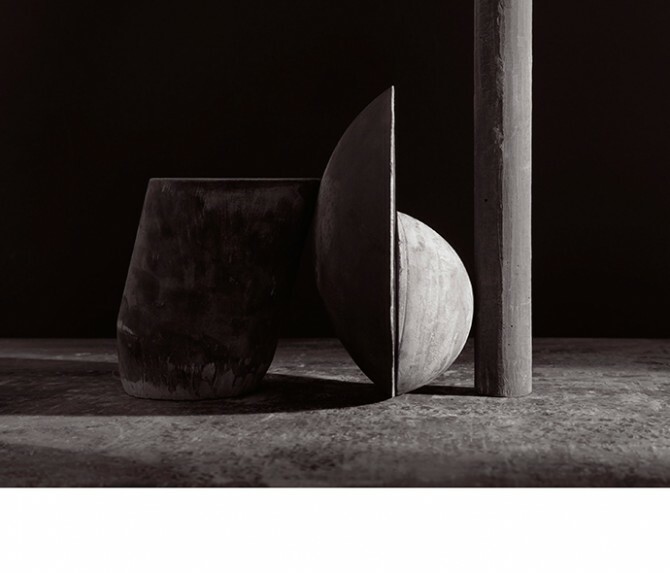 Demonstrating the elegant stillness of a Giorgio Morandi painting, Shirreff’s images are the result of extraordinarily extended exposure times, revealing assemblages of simple, almost Platonic forms and surfaces evocative of “sculpture,” bathed in light and shadows. Shirreff is aware of the legacy of artists before her, like Rosso and Constantin Brâncuși, who insisted on being the photographers of their own sculptures because they understood well that the spaces between objects and their representations are witchy interstices, loaded with meaning. 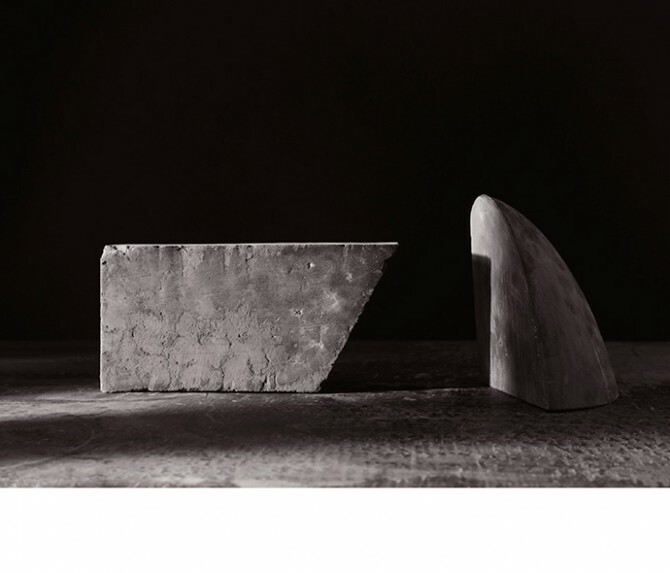 In her case, Shirreff reverses her predecesors’ sculptural logic: the graphite-pigmented plaster objects were built for the express purpose of being photographed, and whether they will continue to exist beyond that is uncertain. They enable explorations in photography – its ability to translate a three-dimensional object into a two-dimensional image – but also explorations of physical scale. 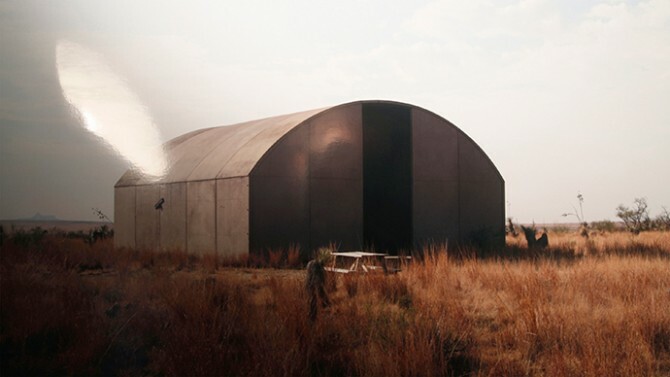 Shirreff likes thinking about how looking at something blown up or reduced in size plays on our imagination. In the final gallery, the 16mm film Sculpture Park (Tony Smith, Amaryllis) (2006/2013) is devoted to Tony Smith’s outdoor public sculpture Amaryllis (1965), an iconic piece of Modern art. Shirreff makes her subject’s quiet presence felt, and snow flurries seem to collect upon it. But the film is a piece of crafted fiction: she built a reduced-scale maquette of the Smith work in her studio based on an image she found on the Internet, re-creating the picture’s inevitable distortions of angle. 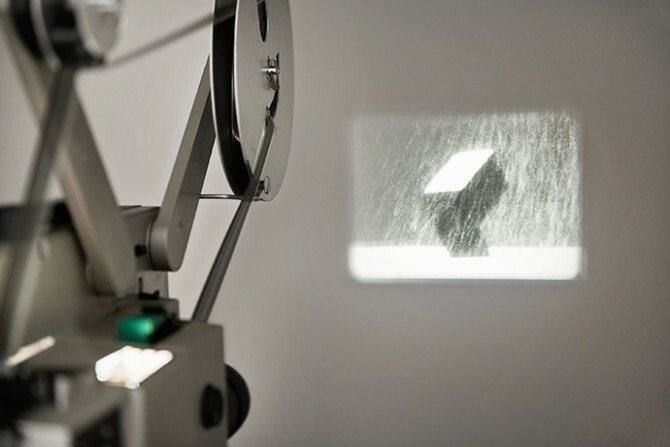 The “snowfall,” for its part, is actually finely shredded Styrofoam dropped from above the camera’s view. Any understanding of the Smith sculpture gleaned from her film must thus be skewed and partial, reminding us of the gaps that sit between a thing and its representation, or, in the age of Facebook, Snapchat, and Instagram, the inevitable gaps between our experience of something and the Internet’s version of it. A critic once claimed that Shirreff’s art advances a veritable “theory of the object.” If it does, her work suggests that any such theory must admit to an object’s essential unknowability. In an era when the proliferation of images, and the immediacy with which we access and consume them, is ever expanding, Shirreff reminds us how much of our relationship to the world is mediated through representations. She also offers a way of working (and a way of looking) that runs counter to the quickly snapped and just as quickly forgotten. 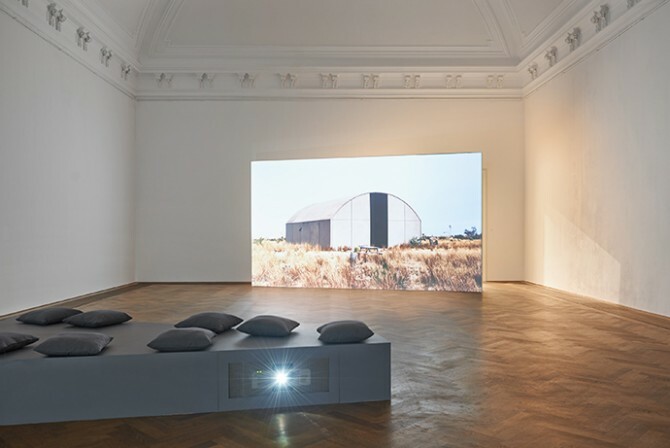 Through this tight selection of works in three different media (film, video, photography), all operating at varied scales and timeframes, Shirreff’s art offers itself as a meditation on encounter – our encounter with things, including sculpture, but also with art in the broader sense, art history, photography, loss, and longing. Her art asks us to take time to experience it – or, you could say, to encounter it, all the better perhaps to “unknow” the things she pictures in it. Erin Sherriff was born in 1975 in Kelowna, Canada; she lives and works in New York, USA. *All materials published here courtesy of Kunsthalle Basel. All rights reserved. Dynamic, experimental, rigorous, open-minded, and accessible, Kunsthalle Basel is a place for audacious art and exhibitions by emerging artists. Established in 1872 by the Basler Kunstverein (Basel Art Association), Kunsthalle Basel is world renowned for engaging with pioneering practices in contemporary art. With its majestic, skylighted spaces, the Kunsthalle is a truly exceptional place to see art. It organizes about eight exhibitions per year, featuring international and Swiss artists. The shows often take innovative forms and involve newly commissioned works. Throughout the year the Kunsthalle also presents dynamic public programming—artists’ talks, lectures, film screenings, and readings—to contextualize the featured artists’ practices. Kunsthalle Basel looks back with pride on a long history of exhibitions that nurtured the development of art and supported, early in their careers, emerging artists who would go on to become part of art history. In the early twentieth century it hosted major solo shows by Edvard Munch, Paul Gauguin, Sophie Taeuber-Arp, Vincent van Gogh, and Piet Mondrian. In subsequent decades it featured Jackson Pollock, Alighiero Boetti, Joan Jonas, Jeff Koons, and Richard Serra. And more recently we have been proud to present solo shows by Moyra Davey, Mark Leckey, Superflex, Piotr Uklanski, Danh Vo, and Anicka Yi, to name only a few. The exhibition is supported by Christ & Gantenbein. Kunsthalle Basel thanks Ricky Alas, Scott Briscoe, Emanuel Christ, Amada Cruz, Matthew Droege, Sascha Feldman, Katharina Fichtner, Christoph Gantenbein, Stephen Gross, Frank Heath, Michael Jenkins, Ryan Martin, Shea Martin-Shirreff, Paola Morsiani, Jenifer Papararo, Riley Robertson, Rob Weiner, Jeffrey Weiss, and Artpace, Chianti Foundation, and Hammer. Every Sunday at 3 p.m. guided tour, in German. 4.9.2016, Sunday, 3 p.m. curator’s tour, in English. 22.9.2016, Thursday, 6:30 p.m. guided tour, in English. Children’s tour I Spy with My Little Eye! 27.10.2016, Tuesday, 6:30 p.m. (Art education project inspired by the exhibition of Erin Shirreff and dealing with images – from photographic reproductions and cyanotypes to photocopies – with pupils of Gymnasium am Münsterplatz, Basel, in German).